A new favorite show of mine on the Food Network is The Best Thing I Ever Ate. I was watching it one night and thought, I should look up all the places that were mentioned in Chicago and try them out while I'm here. So the neurotic person that I am compiled a list and sent it to my friends. Lucky for me, they jumped on the bandwagon and were up for trying out these places. So we drove out to Avondale, which is northwest of downtown Chicago, to try Urban Belly. The restaurant is literally in a strip mall next to a dry cleaners and a laundromat. 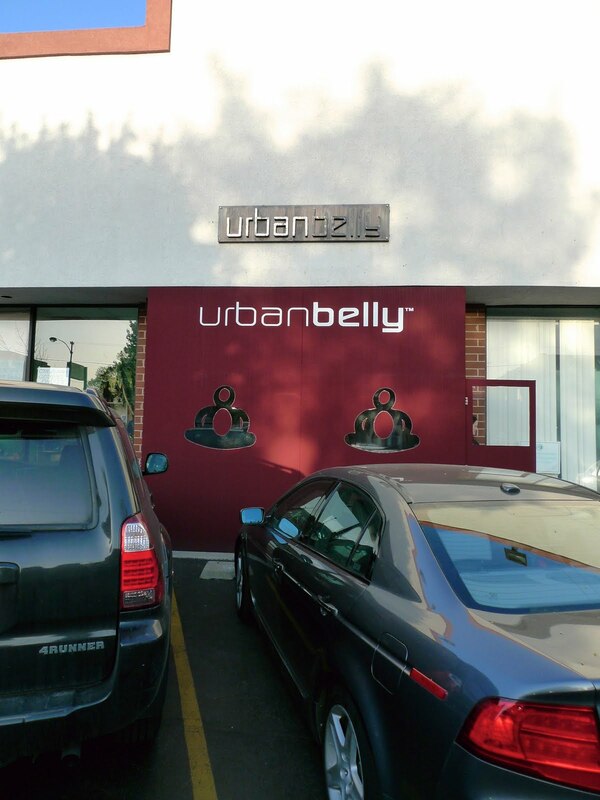 So random, maybe it should be called Suburban Belly. hehe. Urban Belly and it's sister restaurant, Belly Shack, have gotten much press and love lately and I was eager to find out why. It's owned by Chef Bill Kim and at Urban Belly, he combines Korean, Thai, Vietnamese and Chinese flavors to come up with interesting dishes. I'll cut to the chase. I just didn't get it. I thought it was just a mish mash of different ethnic elements that quite frankly, didn't taste all that great. If you're going to add some unique elements to classic staples like Japanese ramen or Vietnamese pho, shouldn't it taste better than its predecessors? Although I appreciate the novelty and I credit Bill Kim for making pan-Asian food hip in Chicago and for making all these people drive up to eat at his restaurant, I wished that he would just strip away all these extraneous toppings and flavors and just make and serve a good bowl of Japanese ramen or Vietnamese pho. 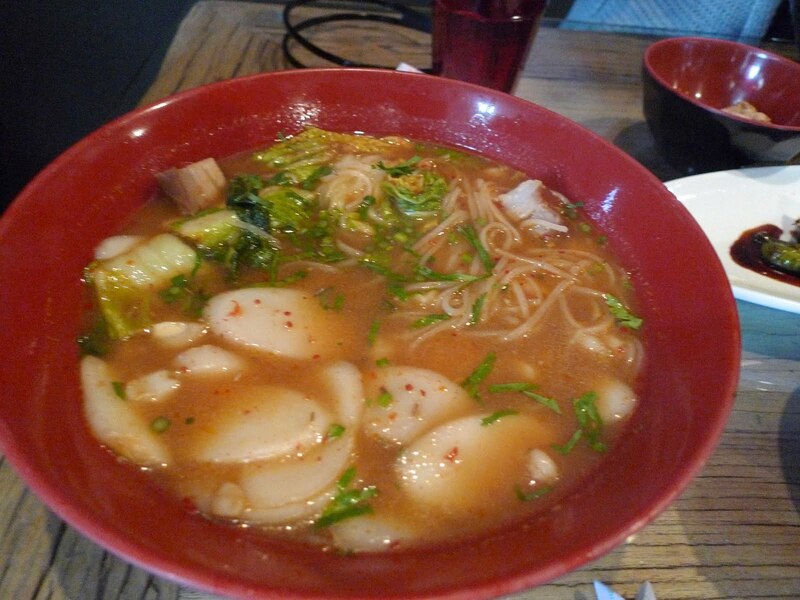 Just a simple, bare bones bowl of ramen or pho or a plate of kalbi, for that matter, would have satisfied me more. Here's what we ordered. 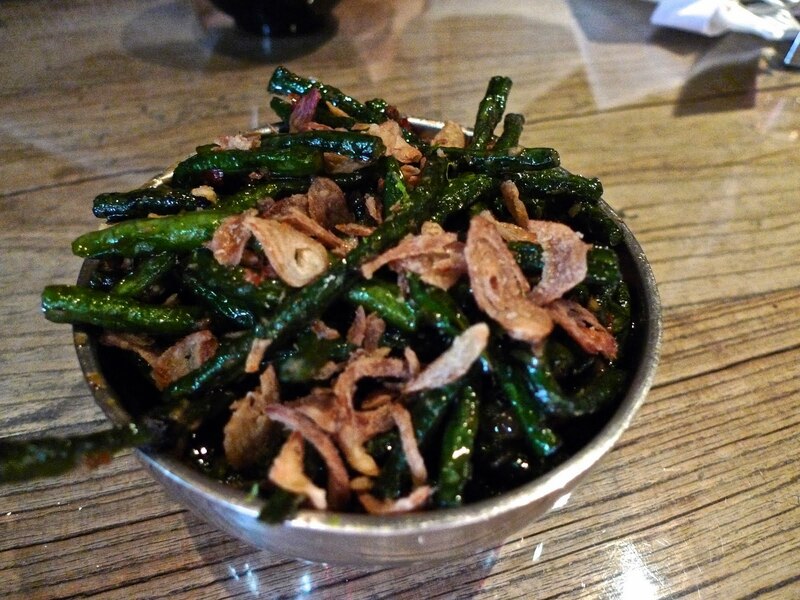 First, we got a bunch of side dishes to share. This was the duck and pho spices dumplings. I don't know if it's because I've been spoiled with such good Asian food in LA, but at $8 for 4 dumplings, these better be freaking amazing ... and they were just OK. 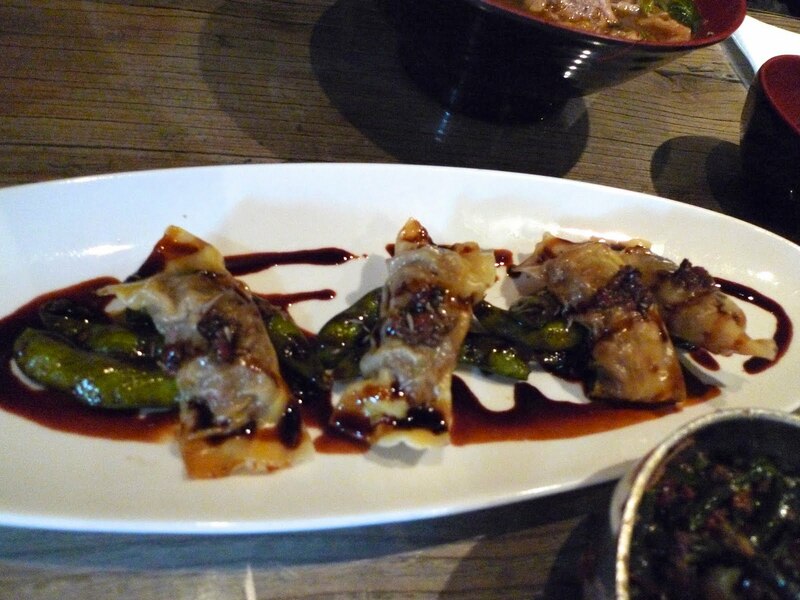 I love duck but maybe dumplings aren't the best way to showcase them. Lesson learned. 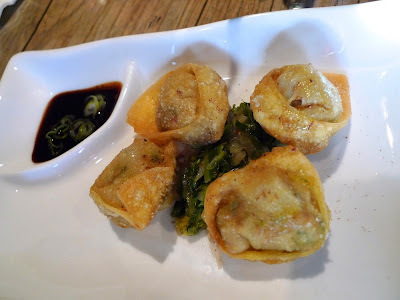 The girl at the counter also recommended the Lamb and Brandy dumplings, which we tried. This was also $8 and at least they gave you some edamame with it. Maybe I'm a purist but I like being able to taste the flavors of the meat in the dumplings like xiao long baos, but while I enjoyed the brandy sauce with the edamame, I felt like it masked the flavor of the lamb in the dumplings entirely. I'm sure it would have been tasty, minus the sauce. What a bummer. 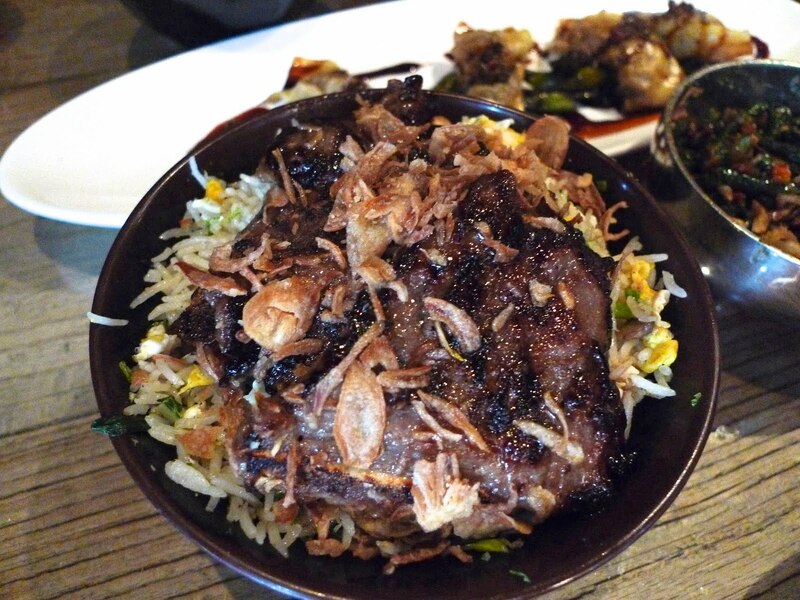 This is the short rib and scallion rice with some fried shallots on top. Again, didn't taste anything different from Korean kalbi with some long grain fried rice on the bottom. This also costs $8. Here are their wrinkle beans with fried shallots. These were OK, but I've had better fried green beans at chinese or thai restaurants. Nothing all that different or special here, but a bargain at $4. 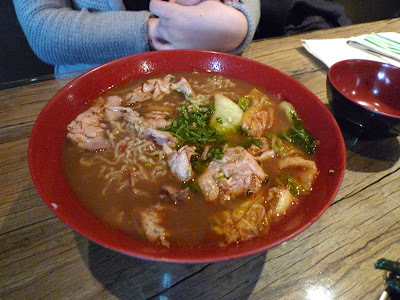 Jake got the Urbanbelly Ramen, which had ramen with pork belly and shitake in pho broth. Sorry for the glare, but this the best picture I had. We sampled all of the broths and they all tasted pretty similar but for a few different additions. I guess in my mind I was thinking it would have a deep pork flavored broth, but then realized that it comes with pho broth instead, so it was probably beef based and thus, much lighter. I was hoping for a deeper, more complex broth. This had Korean rice cakes in it, hominy, which looks like bigger kernels of corn, but tastes more starchy and is used in Mexican cooking, and Kimchi. So it's definitely an interesting mix of flavors, but Susan left most of her noodles untouched. Not a good sign. Aleen got the special of the day, which was pork belly and kimchi ramen. The broth tasted just like Susan's but slightly more sour from the kimchi. Aleen didn't finish her bowl either. Also a common theme was that they put cilantro in everything. So beware if you are not a cilantro fan. 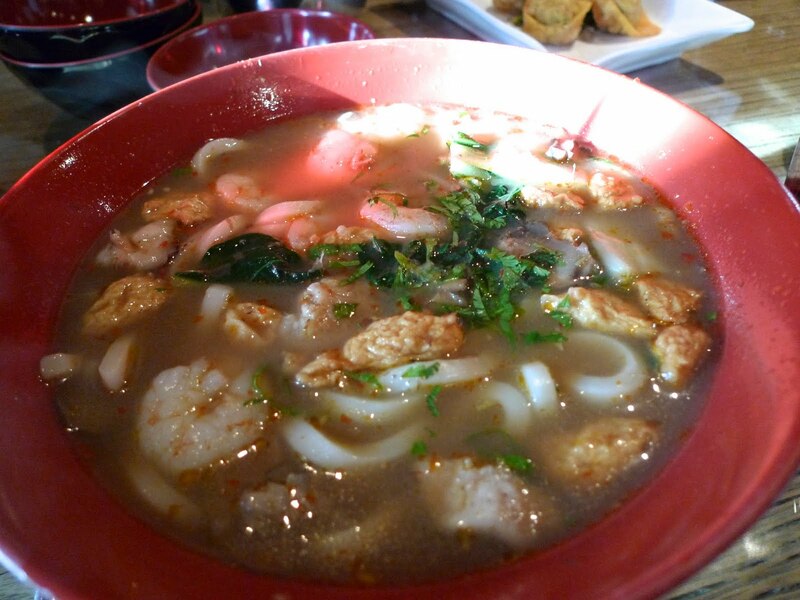 I got the Udon with Shrimp, Coriander and Sweet Chili Lime Broth. I felt like I was eating udon with a Thai soup. I like udon and I like Thai soup, so I guess there wasn't much to dislike about this, but again, didn't leave a lasting impression. I just felt like I could have gone to an Asian restaurant and gotten tastier dishes for a lot less. Clearly I am in the minority though, because whatever Chef Kim is doing, it seems to be working for the Chicagoans. I felt like we were rushed to eat and get out as quickly as possible to accommodate the groups of people waiting to be seated in this relatively small restaurant. I personally did not love this place and am on the search for better Asian noodles in Chicago. 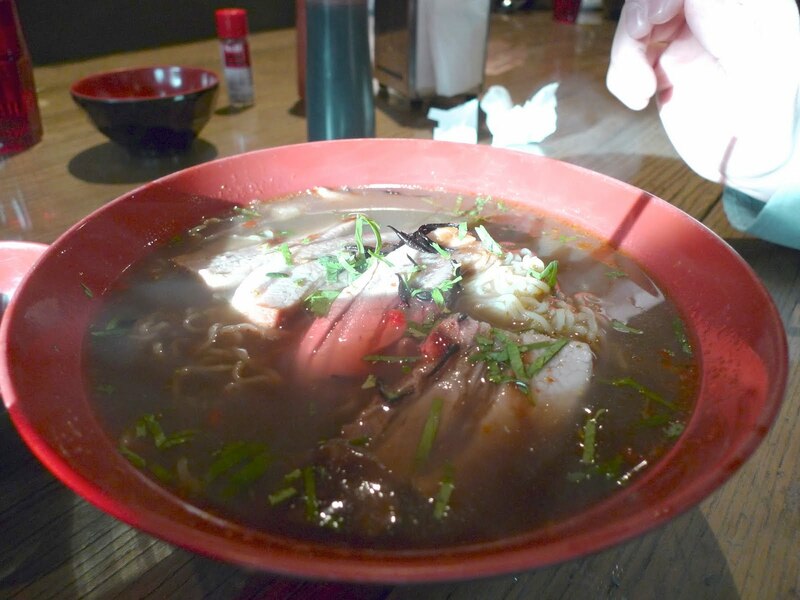 I have my fingers crossed for Takashi for ramen on Sundays. I hope I have better luck there. I am totally craving Ippudo in NY right now, you have no idea. my hands make a cameo. :P i agree with your analysis... wasn't a big fan. i love that i can remember all our restaurant visits by visiting your blog. hehe. Yeah it was fancy dduk gook, but I'd rather eat my grandma's dduk gook than this. I was not a big fan. I agree, I don't really like dduk gook all that much either, esp not in ramen. I guess I'm really traditional in that way, but I love homemade dduk gook with beef broth. Yum!